Pigeon traps are the most effective way of getting rid of pigeons. Pigeon Fact: The feral pigeon also known as “flying rats”, can exhibit a variety of colors, most are of the blue-gray variety. Male pigeon’s are more colorful than female pigeons. “Pigeon pairs” mate for life, and share in the nest building and parenting duties. They may lay a clutch of eggs at any time of the year. The young pigeons will hatch 19 days later, and are cared for until they can make it on their own. The most common concerns with pigeons are roosting on or in buildings, droppings, feathers, and disease spread everywhere. When the pigeon’s roost in an area, the pigeon will leave behind feathers and nesting material, fleas and mites, and of course, most of all, they leave a lot of droppings. Many urban areas are covered with pigeon poop. They defecate a lot, and can cover an area with piles of droppings. The pigeon droppings are not only unsightly, they’re caustic and can wear down stone or metal. Most of all they’re also unsanitary. The droppings of the pigeon are high in nitrogen, and can grow fungus. People can inhale the fungal spores and contract the lung disease histoplasmosis. For this reason, it’s not a good idea to let pigeon droppings accumulate. When pigeons live in attics or ductwork, the problem is more likely to occur. Our work begins with a thorough inspection of the property. This first step is the most important. During the inspection, All City Animal Trapping will determine which species is causing the problem and how the pigeons are entering the structure. Every building is unique and attention to detail is vital. We take pride in performing the most complete inspections possible. We do this by scouring the inside and outside of the structure including the rooftop, attic, crawlspace, home proper, and landscaping. Capturing them in traps placed near their roosting, loafing, or feeding sites can effectively control pigeons. Pigeon traps can vary in size, generally, the larger the population of birds to be trapped the larger the trap should be, although in some instances multiple small traps can be more effective. At All City Animal Trapping, we construct and customized pigeon traps. 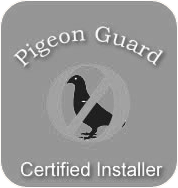 Pigeon Guard has been of service to thousands of clients in and around Toronto since 1991. Pigeon Guard handles pigeon problems with a handful of key tools which include trapping, mesh, netting, spikes, angle guard, electrical shock track or other appropriate means. Copyright © 2016 Pigeonguard. all rights reserved.